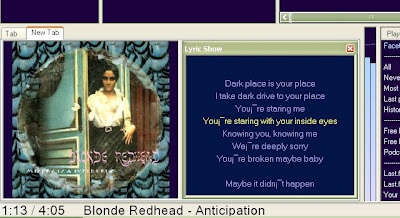 I think it is possible to display the lyrics of the current playing song in Winamp. The major trouble is that the component only works with the "columns" Interface, not with the default interface I presented here (and use myself). Ignore this section if you use the columns_UI interface. Too see more about user interfaces (UIs), see that post. (NB: that component is not being developed anymore since May 2008. 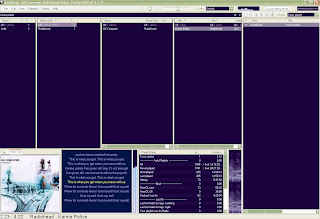 It still works as for October 2008). -Insert a blank frame where your lyrics are going to be. Your window will probably display something like "Artist: ..... Title: ........ Album: ..... ", or maybe lyrics. Now move this frame to the place you left free for it. You will get something neat. In the context menu of the panel, you can change the font and colors. To change background color go to Context menu>Settings, then in the Display tab, uncheck "Transparent background" at the bottom. WARNING: This panel is fixed to the screen. This means that if you move/resize foobar2000, it will not follow, but rather stay in the same place. That's the major shortcoming of the dockable panels. If they are donwloaded, they will be copied on your disk or in the file. NB: Some lyrics have no time data, and will not be sync'd. They will scroll regularly, but you can drag them to adjust. 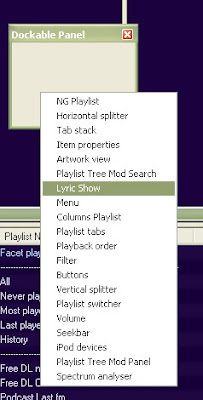 You can fully configure it (will it download, where will the lyrics be stored, when will it scan for it, etc) in the context menu of the lyrics panel > Settings. If you don't want to know about this, leave the default config. -If it doesn't change, try Context Menu>Online Search and look into it. -The shortcoming of this method is that it requires dockable_panels, and the panel is not linked to the main window. You can add your own lyrics to the files.